Windows 10. One Step Forward, Six Steps Back. This certainly wasn’t what I was going to do for my first post, but over the weekend, I spent a good chunk of time trying to get Windows 10 working on my Dell Venue Pro 8 for testing. I have a ton of hardware in all shapes and sizes, but I wanted to try Windows 10 on a ‘real’ tablet, and try to use it like I would any tablet. My current favorite, the Toshiba Encore Write 2 is still safely on Windows 8.1.x, but since my Dell was no longer being used heavily, I figured it was the perfect test. I’ve installed Windows 10 (all builds, but currently at 9926) on several machines, a generic Dell laptop, a home PC tower that serves as the guest/office PC, several VM’s, all work pretty well–as desktops. It’s been fast and pretty simple, with the normal glitches one expects from a build this early in Windows. In fact, Windows 10 on the desktop is clean, fast and pleasant to use. For some background (that someday will show up in a What Do I Use article) I am technically ‘all in’ on Windows and Microsoft services. I’ve been so for pretty much all of my computing life both at home and work. I have dabbled with Apple and Android, and even own a few devices on those ecosystems, but I ‘live’ in Windows. I absolutely embraced the Metro environment and have a number of tablets I use–as actual tablets–routinely. I use Mail, Tweetium, NexGen Reader, Reading List, Xbox Music, Smartglass, etc. A number of news apps, a few games, and some others like Grapholite for network diagrams, Qool for brainstorming and Insteon home automation software. For me, the ‘app gap’ is something I haven’t experienced. I use a ton of Metro applications every single day, on tablets and desktop. I like them. They function well. There are a lot to choose from. They’re cool. Except of course Office, which recently has shipped in testing, so that’s not too far away. Starting apps, flipping through open ones, tucking things away on my reading list, reading and reviewing tons of internet articles, pushpinning links to my Lumia 1520, tweeting a bit, listening to music, all can be handled with ease and quicker than I could on any competing platform. Life was good. As someone as all in on Windows I, like many, always look forward to what’s to come. I couldn’t wait to have Cortana on the desktop, streamline functionality, use Universal apps. And Windows 10 has been pretty damn good so far. On the desktop. It’s a mess on tablets. A horrible, steaming pile of confusion on tablets. Really. It’s awful. This has to be fixed before release or Microsoft needs to give up on the whole tablet concept. Just quit if this is by design. I mean it, I really like Microsoft products, but if this is their idea of a touch friendly OS, Android and iOS have already won. Over the past few days, I had committed to moving my now underutilized Dell Venue Pro 8 (32GB) to Windows 10. Bugs and all I wanted a good tablet test machine. After trying for hours to clean enough off the tablet to get the 5GB space required (this tablet was before the ‘Windows with Bing” compressed OS option) I was there. Ran the web setup, then Windows update, then failed. And failed again, and again. What I kept running into was a space problem–no matter how much I tried, no luck. So I decided to run setup from a USB drive set up from the ISO. After quite a bit of fiddling, I found that it required even more free space! 8GB to run. Ugh. I reset the VP8. If you’ve ever done a Windows 8.x reset, you know it’s a wonderful tool that completely wipes and resets you back to the factory fresh image of Windows. I figured clean out of the box Windows would be my best chance for enough free space. After the reset, 12GB free! Then came the daunting realization that you can’t do an upgrade with out all the updates. All of them. Tons. A mountain of updates. This took the better part of a day, carefully babysitting the restart and touchy stalls/time outs that sometimes happen with GB’s of updates. But I was determined. After finishing the Procession of the Updates I ran the disk cleanup/updates cleanup to purge the disk once more, winding up with about 9.5GB free. Re-running the Windows 10 setup from the web fails again. No reason, just fails with a little pop up saying it failed. So my last ditch hope, I plug in my ISO into the USB adapter and run. SUCCESS! For the first time in days I feel like something worked. It even was going to keep my settings, apps, favorites, etc. None of those headaches were due to Windows 10–in fact just about any upgrade or install of the OS would have had similar issues due to the size constraints of these tiny storage devices (but these are more and more common, the update routines need to be aware of that). Once there was enough space and the correct media, it sailed through like a champ. Giddy with anticipation and clicking on my login, I am unceremoniously dumped onto the desktop. Something I had not seen or used on this tiny tablet except in the most dire of circumstances (okay, to copy files to the SD card, but whatever, I never used the thing). I automatically swipe in from right to get to start, oops, no, no start there. But then I touch ‘TABLET MODE” in the action center…because maybe they just activate the desktop by default in these builds. 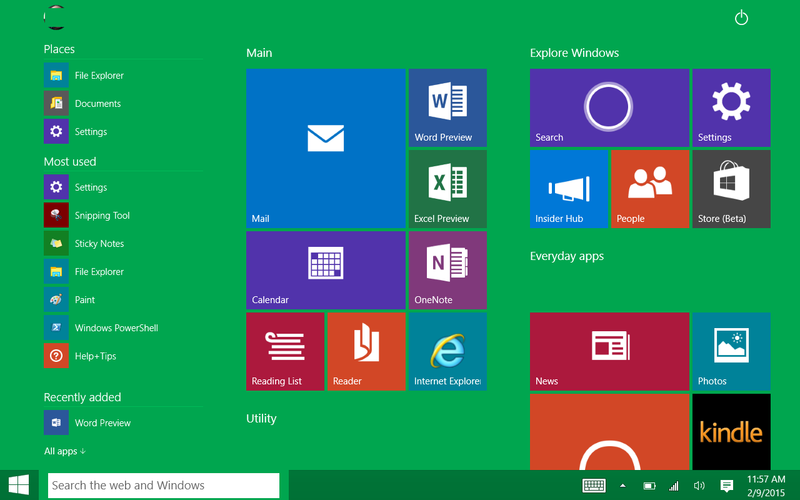 I touch the start menu in the lower left, a slightly awkward touch point actually. I am presented with a blank green ‘start’ screen, empty save for the Cortana Search box and an ugly list of apps with tiny icons on the left. Tiny. Hard to touch. On the Start Screen. No live tiles, no default apps. So I begin to pin the tiles for things I’d like from the All Apps micro-list. Tiny touch targets. Tiny icons. Tiny. Little. Impossible. Icons. This is a huge step backward from Windows 8. The start screen, or basically the inflated, ugly start menu, shows no signs of life, no updates, live tiles are decidedly dead. Maybe this comes later, after it settles a bit and they light up again with data. And the taskbar is ever present. Reminding you this is really a desktop machine. Everywhere screams desktop. From the extra clutter on Start, to the task bars, to the too-tiny-to-touch-icons littering the interface. Everything is desktop centric. Gone is the easy to flip through open programs of the left swipe, replaced with the desktop focused Task Switch that cannot be used one handed. Gone are charms, which apparently everyone hated except me, to easily share to my reading list or email or twitter. Settings might as well now be called Control Panel II rather than the elegantly reachable right hand settings panes. And how in the world to snap applications when in tablet mode? Still haven’t figured that one out. So far as I see, every single, solitary useful touch function has been expunged from Windows 10 and replaced with a desktop focused one. It’s as if Microsoft is saying “We’re so sorry! We don’t know what we were thinking! Please forgive us and we’ll never do anything like touch again”. They threw the baby out with the bathwater. And then just to be sure, went and got another baby, filled up another tub and threw those away too. In a race to capitulate to the desktop, they killed or maimed every touch feature that made Windows 8 something useful–if you actually learned how to use it, and didn’t just whine about it. It worked as a touch based UX quite well. I never quite understood the common complaint of it being ‘jarring’. You know what isn’t jarring? Click the desktop and staying there. Pinning your apps to the taskbar. On touch with the right apps (yes, you have to hunt them down, and of course, there needed to be more in every category) Windows 8.x could be elegant it it’s own way. Universal Apps could help ease this. Actually what we need is a hybrid of the improvements to desktop when in ‘desktop’ mode and smooth easy to use touch features in tablet mode. Just like before, Microsoft is over compensating with too much mouse and keyboard and dropping too much from touch. People were finally starting to at least tolerate Windows 8.1x, and Windows 10 could have crafted features to enhance the experience rather than changing it all yet again. It’s heavy handed and simplistic in undoing anything good about the touch functions in the OS. Maybe I’m being too critical–it still has a way to go before launch, and maybe there are some good revisions out there coming for touch. I’ll be patient. It could happen. I will test each build like it’s Christmas morning hoping they have something up their sleeve. Right now, there are so many interface compromises that it’s actually difficult to use the tablet mode at all. It’s not muscle memory or complaining just because of change, it’s actually bad design. I can’t reach things, I can’t get to Start, I can’t hit the severely tiny touch points, and everything leads you back to the desktop. Maybe this is how people felt about Windows 8…I never did, because I thought for once Microsoft made something look cool. So there the Dell will sit until next build, I can’t use it like I thought I would be able to, it just doesn’t work anymore. It runs the Windows 10 code beautifully. And that’s the problem.